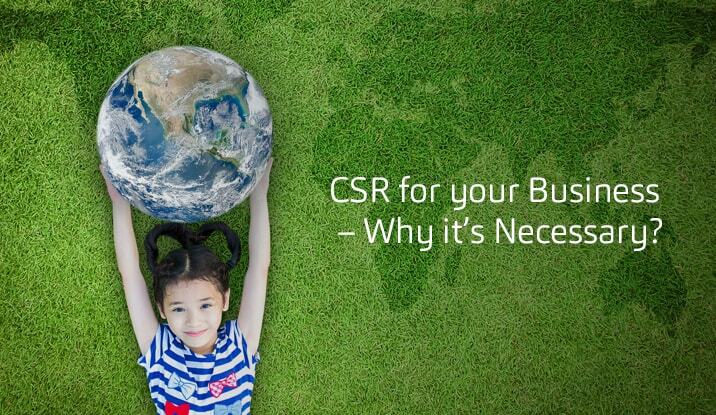 CSR for your Business – Why it’s Necessary? If you are planning to start a business, or if you already have one, then you must ensure that your business model has CSR as one of its core factors, because it can turn out to be a driving factor for your business in the long run. And in fact, it can deliver results at short notice as well, if you strategize and plan accordingly. CSR for businesses cannot be termed as a prerogative and should be a privilege for organizations to be able to perform this service for society and beyond. It is in fact, to put it simply, a duty. And sadly, many businesses actually refrain from performing this duty – or else, they would do very little, and think that they have done enough. The CSR Initiative: Are You Ready? CSR means Corporate Social Responsibility, but it actually encompasses more than just businesses benefitting society. It also includes businesses benefitting the whole world by being as environment-friendly as possible. It can help in promoting the economy and indirectly bring in the social stability of the communities they address, by getting the maximum ROI (Return on Investment) for every investment that they make and every resource they use. You should never miss out on incorporating a concept in your business that is inherently beneficial. And CSR is that kind of a concept. To explain this further – a business that works to fulfill its CSR, benefits itself, because such an initiative enhances its value and need in the society. While on the other hand, many people, objects and institutions get benefitted by the companies executing their CSR properly. And last but not the least, those businesses that do not practice CSR at all or have very little knowledge of CSR, feel motivated when they see members of their own fraternity getting benefitted by making a difference to others’ lives. And hence, they too feel like contributing on their own and follow suit. Now, How Can You Essentially Make a Difference with CSR for your Business? 1. Firstly, by carrying out CSR, you would be contributing to the effective risk management of your business, as your reputation for doing good would actually catalyze the process of getting your business out of sticky situations when all else fails, and then further restoring your reputation when the storm has settled. 2. Secondly, if you carry out an active, planned CSR, rich in philanthropic efforts, with a comprehensive outreach to all the three verticals of CSR, then that would put your business under much less scrutiny than other businesses, that don’t practice CSR at all. Also, in most cases, taxmen, regulators, governments, media and the public are not quite likely to bother you about your company practices as much as they would do to others who don’t fulfill their CSRs. 3. And finally, if your brand is of any value to you then practicing CSR would definitely protect it, improve it and even distinguish it from other brands based upon your core ethical values as demonstrated through your responsible actions. At the end, there is something really profound to understand – which is – that business itself is a mutual servicing exercise between two parties. And hence it should enable any business to look at CSR quite easily, as just an extension of servicing and not any option to take or reject. By practicing CSR you would essentially be ensuring the most important aspect of any business, that is, finding the right people to do the right jobs in your organization, and thus steering it towards success. So, CSR should be a part and parcel of your business model alongside concrete plans for profit-oriented quests. It should be inherent and an ingrained part of your business model. Only when you, yourself will start feeling for the people around, will be able to make your CSR a success!